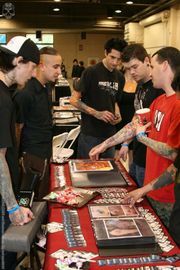 Tattoo conventions are an organized gathering of tattoo artists and enthusiasts, often open to the general public. They are an excellent place to meet other tattoo enthusiasts in your area, as well as getting a rare chance for work by (and interaction with) talented out-of-town artists. There are usually many contests and events like side shows, Polynesian fire dancing, and bands to keep you entertained. If you can, call ahead for discount passes, most conventions have cheaper prices for pre-purchased passes. Also, if applicable, ask for a convention room rate from the hotel and try to book in as far in advance as possible. Get that hotel room ASAP, you may want to try to get there on Thursday (assuming the convention is on a weekend), that way you're all settled for Friday and into that social groove thing. You could also attend a convention outside your city and area as a tattoo vacation. With some research, you can find conventions in a lot of interesting cities. If you want to get work done by an artist, particularly a popular one, then try to book time ahead with them, you may get there only to discover that the artist is booked from day one. You can also buzz websites for a listing of artists, or call the infoline for a brochure to see who is working the show. Merchandising makes money, but at the last hour of the last day you will find t-shirts and other prices mysteriously go on sale, so you could save some bucks, however you miss the opportunity to buy a hot t-shirt, too. Some of the artists work hard on their artwork and flash, so be careful when taking photographs that you do not give the impression that you are taking pictures of flash or custom artwork for the purpose of stealing. Also, if you have artwork that you want to show around yourself, and if you don't have a booth, have the decency to let the promoters know upfront and inquire as to what arrangements you have to sell or trade your flash/machines what have you on their floor. REFRAIN FROM PLACING BEVERAGES ON ANY TABLES WITH ARTWORK, EGAD MAN the life you ruin may be your own!!! Don't be whimsical, whether you're getting a tattoo or buying a book don't judge either by the cover. Just because they're at a convention it does not mean they know what they are doing, as always, check out the portfolios first and foremost. Don't run around like a giddy kid, or interrupt working artists for a photo, just ask politely when they have a free moment, often enough you can get photos in the lounge/ bar later, and don't touch or hug a working artist, he/she needs a steady hand!! Most of all get out there and support your artists, you don't have to get tattooed, and if you are interested in learning more about the art, conventions have a wealth of information and collectables. This page was last modified on 17 August 2011, at 02:49.